I’m off to the Florestan Festival in East Sussex today. I always enjoy imagining people setting off towards Peasmarsh from many different compass points. Most of our rehearsals have happened to the accompaniment of pouring rain, so we can only hope the spell of wet weather is almost over. 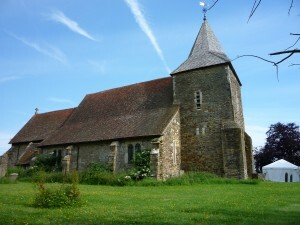 The festival takes place in a little Norman church; the village moved away centuries ago after a plague outbreak, leaving the church standing alone in the middle of fields. When the sun shines, it’s lovely to see our audience sitting on the grass in the churchyard with their picnic baskets, but when it pours with rain, you suddenly notice how little infrastructure there is in the countryside. It’s amazing how many music festivals there are in England which depend on good weather, but often don’t get it. Yet we go on planning our summer festivals and telling people to bring their picnic baskets. The triumph of hope over experience! Liked this post? Subscribe to the RSS feed for more of the same! This entry was posted on Thursday 9th June 2011 at 10:00am	and is filed under Concerts, Daily Life, Florestan Trio, Musings. You can leave a response, or trackback from your own site. Susan Tomes is a pianist and writer. Renowned as a soloist and as a chamber musician, she's the author of five books. Read her biography or send her an email. Get all the latest blog posts delivered to your email inbox. Get all the latest blog posts delivered to your favourite RSS reader. Enter your name and email address and you'll receive an email with a link to download a free full track, Billy Mayerl's 'Ace of Diamonds'. No cost, no catch, just one of my MP3s for FREE!